Home > 2016 > 05/06 > Can Maroon become a regular top-six forward? It might seemed far-fetched for a 28 year-old who has 34 goals and 93 points in his first 220 NHL games to become a regular top-six forward, but very few players are blessed with the opportunity in front of Patrick Maroon. Maroon has proven he can play with skilled forwards. He played with Ryan Getzlaf and Corey Perry in Anaheim, and he thinks the game and sees the ice well enough to not look out of place alongside them. With the Oilers, he played the most EV minutes beside Jordan Eberle, Connor McDavid, Leon Draisaitl and Taylor Hall. Team USA has him riding shotgun with the Auston Matthews. He’s getting every opportunity to become a top-six forward, but how productive can he be? It is hard to say, and 16 games with the Oilers is a very small sample size. He scored more points, 14, with the Oilers than he did in 56 games with Ducks (13) this year. He wasn’t in great shape at training camp and it cost him icetime under Bruce Boudreau. In his first two full NHL season Maroon was consistent. In 2013/2014 he scored 11-18-29 in 62 games (.47 points per game). In 2014/2015 he tallied 9-25-34 in 71 games (.48 points per game). He was even better in the playoffs, totaling 9-9-18 in 29 games (.62 PPG). Outside of his point totals, his overall game was more focused and balanced in the post season. At 6’3″ and 230 pounds, he is load for any D-man. Most can’t handle him when he is pushing the pace and energized, but finding that gear consistently in the regular season has held him back, at least in the NHL. Maroon has proven he can be an effective scorer in junior and in the American Hockey League. In his only season with the London Knights of the Ontario Hockey League, he scored 35-55-90 in 64 games. He was 19 years old and led the Knights in scoring. Jadran Beljo and Akim Aliu were second and third in scoring with 62 and 61 points. Maroon was their go-to guy. He’s put up solid numbers in the AHL as well. In 2008/2009 he scored 23-31-54 in 80 games as a rookie. In 2009/2010 he potted 11-33-44 in 67 games. In 2010/2011 he tallied 26-30-56 in 66 games. In 2011/2012 he scored 32-42-74 in 75 games. In his final season in the AHL he scored 26-24-50 in 64 games before being recalled to the Ducks. His PPG each year was 0.67, 0.65, 0.84, 0.99 and 0.78. He was third, fourth, second, first and first in team scoring in his five AHL campaigns. He also had 62, 125, 98, 120 and 139 penalty minutes respectively over the five seasons. He is a rare breed of size, skill and nastiness, but he needs to bring it consistently to remain a top-six NHL player. We could project what his numbers might be, but I’m not sure how we factor his commitment level into the equation. It is the wildcard, and Maroon admitted as much when we spoke at the season-ending media avails. I asked him directly about the opportunity in front of him. The chance to ride shotgun with Connor McDavid, and the other skilled forwards on the Oilers, but mainly about playing with McDavid. “It is exciting, but it starts with me in the off-season. It is on me and dedicating myself and coming to camp in great shape, being ready, being focused. I had a tough start in Anaheim this year. I was up and down the lineup. I wasn’t ready and I wasn’t playing my best. “I need to focus on what I need to do to get better as a hockey player. It is a great opportunity to play with a great player, but I have to keep working on my footspeed. I have to get in better shape and I’m excited to have the opportunity to come to camp and play with him (McDavid),” said Maroon. I followed up asking him about his focus and commitment. “If I’m being completely honest, I didn’t work as hard as I needed to last summer. I can’t blame anyone but myself. It’s not like I did nothing, but I didn’t do enough. The playoffs were great, and I proved to myself I could be a solid contributor (he scored 7-4-11 in 16 games), but I need to have that mentality all season. It starts in the summer, and I’ve learned from last year what I need to do to ensure I’m in not just in good shape, but great shape when camps opens,” said Maroon. I’ve interviewed many players over the years, and I believe I can tell when a player is just giving you a quote for the sake or it, or when they are being genuine and Maroon very much came across as the latter. He sees the opportunity in front of him, and he loved playing in Edmonton. When the fans gave him the Marooooonnn chant during the final home game, and again when he was named second star, it impacted him. He was overwhelmed. He said it was one of the best experiences of his life. He truly was humbled by it. Combine that emotion with the opportunity to play with McDavid and the other skilled forwards in Edmonton and Maroon looked almost excited about his summer of hard work. Head coach Todd McLellan gave him a chance to produce in Edmonton. He played 145 minutes of EV with Jordan Eberle and produced 3-2-5. In 133 minutes with McDavid he tallied 4-3-7. He was with Leon Draisaitl for 64 minutes and had 2-1-3. In 40 minutes with Taylor Hall he scored 2-2-4. Maroon has two years remaining on his contract. Two solid, consistent productive seasons could earn him a hefty raise and some long-term security. Very few players are presented with an opportunity like this. He has proven he can be a productive top-six forward at every other level. In an extremely small sample size with the Oilers, 14 points in 16 games, and during the playoffs, he’s showed he could in the NHL as well. He has all the tools to become a productive and consistent top-six forward for the Oilers, but it is up to him to realize his potential. After speaking him with on numerous occasions about this subject, I get the sense he won’t waste this chance. 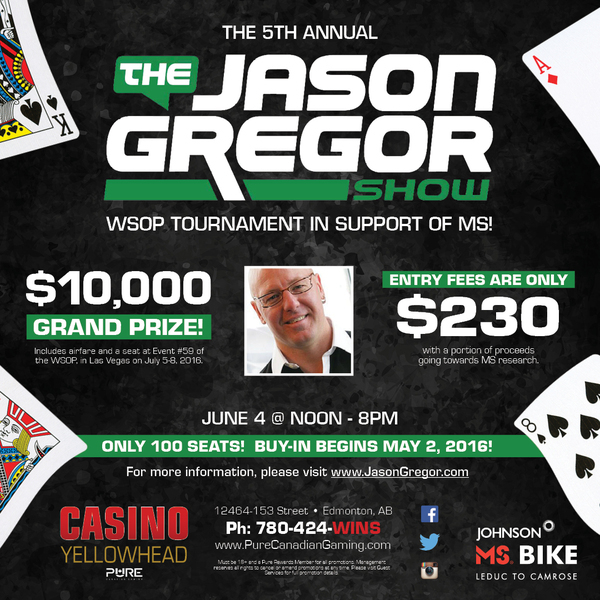 Happy to announce we will be having the tourney at the awesome Yellowhead Casino this year. It includes a complimentary lunch. It sells out fast. You can sign up here. Good luck. BM using a Maroon square as the opening picture is hilarious. Took me a while to get the reference. I don’t think along the same lines as him most of the time. @JG: Be thankful you don’t think along the same lines as BM…. HOW DARE YOU!? Wait… That’s probably true. I think it kind of depends on what role he needs to play within the top 6. It seems guys like Maroon are best applied as kind of ice-breakers. They create room and opportunity for the skilled players while having enough skill of their own to convert scoring chances when given the chance. But as a primary asset? No way. No team has six primary assets in their top-six. They have complementary players. I doubt anyone expects him to be the driver. Being top-six means playing there regularly in my books. I’m curious to see if he grabs hold of the opportunity in front of him. He’s got a unique skill set. 100% agree with you Jason but the Oilers fan perspective is the he IS a primary asset. At the end of the day it’s a team game and the magic of a good coach is how he best deploys the talent he has to work with. On this team Maroon is a top-six complementary player. Nothing wrong with that. Is that colour at the top supposed to be maroon? If it was one of those stupid paint chips at the hardware store, it’d be like “rich red wine” or “red currant surprise” or… um, “bloody nose” or something. Maybe this was a turn-around season for him. Part of becoming a well respected vet. If so, it’s exactly what the Oiler’s need. It’s good to know he’s signed for two more years. If he brings it next year it would probably be good to try to extend him early. He looks like the real deal. And a great deal in the books for PC. Motivation comes from within. A coach yelling at you only goes so far. If your professional opinion is that he is being honest in his personal assessment of a less than full effort of off ice training is correct he may very well have a bubbling spring of motivation flowing. I hope so. Size, hands,mean ,stands up for his teammates ,sees the game well and goes to the net. He is a little slow of foot but you can’t have it all. Isn’t he what the Oilers have been looking for since forever? me neither because it only cost us 3 picks from #57 down and we also got the Rangers 7th rounder as well which we turned into d-man Ziyat Paigin, seems like much better value than the #16 and #33 for Griffin Reinhart deal we made earlier in the draft. I think a combination of two things will determine his ability to hang with McD. One – his commitment to getting leaner, more fit and faster. Two – playing with line mates who are willing to mix in tactics that play toward Maroon’s strengths. Overly rush dependent line mates like Hall are not the answer for Maroon. With Maroon – you want to mix in some o zone possession, puck protection, cycling, net presence and plays back to the point – to get the most from him. Not much good use of Maroon, comes with making the big guy skate back and forth – 400 feet or more – each shift. Good thing he won’t play with hall both playing left and all. Mcdavid likes the rush too but he has such good control of the speed of the game he can and already has made maroon work with him. I love this guy. I’m still shocked the Ducks let him go. Ultimately, not sure about top 6 but there is always room on the roster for a guy like him. Maroon’s production in junior and the minors make me optimistic he can be a valuable contributor here. We don’t need him to score 40 goals. We need him to protect our offensive studs without dragging down their production. I think he’s more then capable of doing that. It sounds like he realizes this is his best chance. I mean, in what other situation on what other team is he going to get a hot like this. Hell, just money wise the guy could be getting padded point totals that land him in a big contract that he wouldn’t otherwise have seen anywhere else. I think he sees this as his shot not just to be a good player, but maybe even like a top 20 scorer and legitimate star in the league. For years Edmonton has been trying to find the next Lucic, but Maroon could end up being the guy everyone else in the league is scrambling to find for the next five years. Sure, he’s not a big Finn, but he could still end up being one of the most lopsided trades in recent NHL history. Good on Chi for bringing this guy in and good on Maroon for seeing his shot. Looking forward to a full season of that pair. Question, if Eberle goes, do you think Kassian could see time on McDavid’s wing? I agree, but I’m kind of foreseeing a situation where maybe injuries play a factor? This also assumes Pouliot is still around. Not sure Maroon will make it all 82 games, so thinking perhaps they try that type of big nasty guy on the right side instead of the left. Would personally love to see Okposo on that right side as I think he can handle the physical aspect a bit more then Eberle, and he can be there as a bit of a veteran leader for McDavid. However McDavid IS the only guy in the league that could pull off sweet saucers…to himself. I don’t think McDavid needs two grinding, drive the net type players on his line. If Eberle goes and Yakupov does not, we’ll likely be sipping on ConYak next season. Also, would you consider a guy like Lucic a grinder? I think when a player is getting over the .6 / .7 ppg mark, he no longer qualifies as a grinder. He’s just a big guy that can play with skill and edge. I think Kassian has a bit more speed then Maroon. Just talking out loud really, but if they can both produce on the line, how crappy would that line be to play against? Just everyone would hate playing against that line. I would just want to have one player that can almost keep up to mcdavid on his line when he does want to go on rushes. Preferably someone with a good shot. Milan Lucic is a space oddity, its like with Bertuzzi in his prime, no I would not label them as grinders per se. I think the biggest thing McDavid needs on his RW is a right handed guy who can float into the slot while all attention is on 97, and slap home one timers all day. We need a Kurri for McDavid’s Gretzky. Lucic would be called a powerforward. Grinder that scores. Still would want a faster winger on the other side tho. Not to nitpick but I would put maroon as a solid middle six guy, just don’t think he’s a sustainable first line winger. I have the same dinner hat. Maroon certainly seized the opportunity to play with McDavid this season. He was brilliant. Is it sustainable? Hard to say. Will he line up beside McDavid for 82 games? I doubt it, but almost all players have ups and downs. It’s really up to Maroon. The sky is the limit for him. Playing with McDavid is a huge career opportunity. He seems smart enough to see that. Sometimes players mature and become more consistent, others–like Dustin Penner, for example–have the tools but never seem to figure out how to sustain a high level of play. I don’t see how anyone on the basis of what Maroon showed us this past season can say that he doesn’t belong in the top six is beyond me. Maroon might eventually play himself out of the top six next season, but he was dynamite for the time that he was here. McDavid is a great player, but Maroon was certainly a complimentary addition to the line. I know there are fans who will disagree with what I am about to say, but I, personally, like having someone who can look after McDavid like a little brother. People forget, but Sidney Crosby had his career threatened by concussions, and while I know that there are fans who would disagree, I think that players are less likely to take liberties with McDavid when Maroon is riding shotgun for him, playing on his wing. That, for me, means a lot. 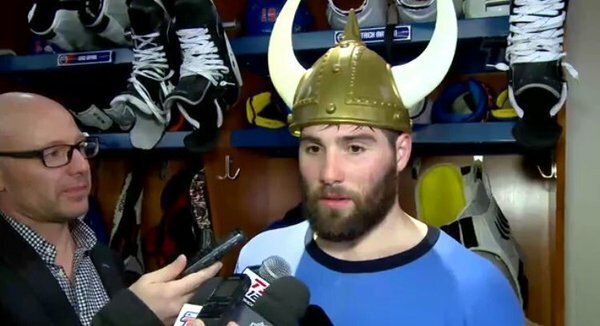 I’m sold on Maroon based on what we’ve seen; he’d have to prove himself unworthy to me. Maroon can significantly increase his earning potential fulfilling a niche he seems naturally suited for. In Maroon, I see a man who is smart enough to figure that out. Good start as an Oil, but hope he’s not a Dustin Penner repeat; came to camp not in shape, up and down the Duck line up, complacency. Stay away from the pancakes.